You may think that you can’t afford an investment in a network management system but the reality is that you can’t afford not to have one. Business critical apps and services such as e-commerce, voice, and business intelligence are becoming more and more of a competitive differentiator for businesses of all sizes, and network management and monitoring software has become an essential business tool that can directly impact the bottom line. 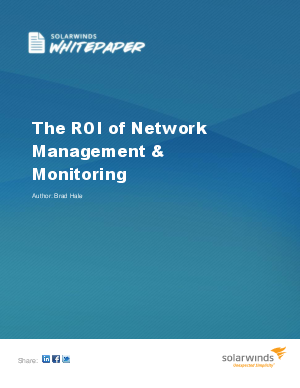 This whitepaper will help you quantify how an automated NMS will help you reduce network downtime, improve service levels and reduce operating costs. Once you understand the impact of your network performance on revenue and productivity, you can easily calculate the ROI of an investment in an NMS.